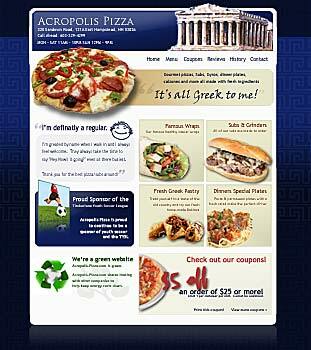 John Panakis, a local Greek pizza restaurant owner, was looking for a website that would do more than just exist. This website is powered by a CMS which also allows customers to send in reviews which John may make instantly available on his website's testimonial section with only the click of a button. John's buffalo chicken pizza and other gourmet pizza's are to die for. try Acropolis Pizza's famous ceasar wrap!